Nobody has an extra hour in their day for working out, so you have to make the time. If you can take out time to sit and watch television, then you must also find time to go to the gym, or walk or run, and so on. But what if you can do both? Lie on your back, head flat on the floor, and pull your knee up towards your chin (it does not have to touch), then slowly push it flat to the starting point. Do not let your leg touch the floor. Do this 25 times for each leg. The seated twist is a move in either direction, that releases your spine and allows energy to flow upwards through your body. Lie down on your back with one dumbbell in each hand. Start with your arms an inch or two over your chest. Lift all the way up and all the way to the sides (your left arm to the left and your right arm to the right). Don't let your arms touch the ground. Do this 25 times. Lifting weights, one in each hand, stand up and extend your arms over your head. Bend at the elbows, so the weights and your hands are behind your head. Bring weights back up to starting position. Do this 25 times. If you don't have weights, anything heavy that fit in your hands will do. Begin with light weights. Ride an exercise bike or walk on a treadmill as you watch TV and don't wait for commercial breaks. 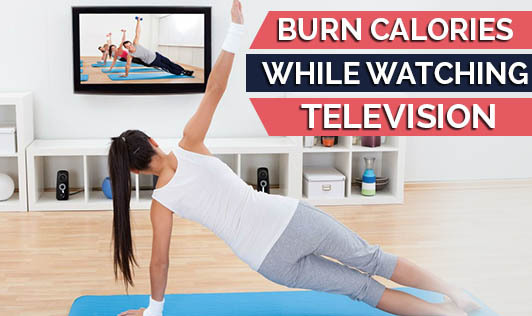 Ideally, the time you exercise should equal or exceed your TV time. If you can't do that, try to watch less than an hour of TV a day. Another thing you can do is find a good music channel and dance to every song that plays on it. Dance in such a way that it engages your whole body. Try the shoulder finger stretch to relieve tension in your shoulders and hands with a lengthening move. After stretching, continue your standard exercises. Simple yoga stretches can be done during your favorite shows. They'll increase your flexibility and get your blood flowing. You don't have to do every exercise; mix it up and do different ones on different days.